Perhaps I'm biased because Ellen Schreiber is one of my all-time favorite authors but I really liked this book. Her stories are always light-hearted but filled with adventure at every turn. She did a great job creating the world of werewolves in the Full Moon series just like she did in the Vampire Kisses series. This book wasn't as great as the first one though, at times it felt like it was dragging on and had a lot of repetition. One of Celeste's best friends Ivy really got on my nerves at several parts of the book but that just goes to show that Ellen is really good a characterization because she makes them so believable. 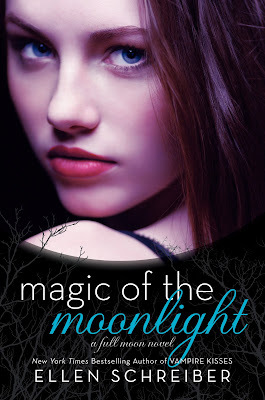 But it was still a good book nonetheless, I've had a lot of stress from things that have been going on lately so it was nice to unwind to Magic of the Moonlight at the end of the day. In my experience I've learned authors generally tend to write about things they know or have experienced within their own lives. In different books that Ellen has written she has a reoccurring theme of towns being split into two sides (Uptowners and Downtowners, Eastsiders and Westsiders) which always has me wondering if she had dealt with something like that in her own hometown growing up. I'm really excited to read the last of the Full Moon series, Full Moon Kisses as soon as I can get my hands on it. One of my favorite things about Ellen's writing in book series is the way she does cliffhangers; something terrible could be going on and things are out of control but she always leaves the readers with a sweet moment between the main characters/couple.